As cannabis products and user tastes become more sophisticated, cannabis package design is following suit. With exotic names and novel products now an integral part of cannabis manufacturers’ retail and marketing strategies, creative packaging has become a way for producers to distinguish their brands. The packages seen in dispensaries today are a far cry from the plastic sandwich bags that were the common way of distributing marijuana in the days before cannabis became legalized. Legalization also has brought new laws that define what is required and what is disallowed in cannabis packaging. Twenty-four states have introduced laws governing the packaging of cannabis products. While their guidelines may differ, a common factor across all the states’ laws is the requirement that cannabis packaging be tamper-proof and child-resistant. The laws also aim to prevent children from gaining access to cannabis products because of improper labeling and packaging. The laws prohibit names and imagery on the packaging of cannabis products that would mislead children into thinking the products were intended for children. In Oregon, for example, the state’s Liquor and Control Commission (OLCC) ruled that “kid-friendly” names like “Girl Scout Cookies,” “Candyland,” “Cinderella 99,” and “Charlotte’s Web” were prohibited. However, as Allie Beckett on marijuana.com points out, these naming prohibitions do not apply to alcohol, a more dangerous substance for which there are numerous childlike brand names on the market, such as “Hello Kitty.” The underlying aim of the cannabis naming laws, she suggests, could be to restrict cannabis producers from using the international trademarks of giant corporations like Disney. Another requirement among seven states that have legalized cannabis (Alaska, Colorado, Hawaii, Maryland, Massachusetts, New Mexico, and Oregon) is that cannabis packaging must be opaque, with the product unable to be seen until the container is opened. Here too, cannabis is being restricted in ways alcohol is not. Being able to see a cannabis bud’s color and texture is part of its allure, just as a liquor’s color is part of its attraction for consumers. Despite the restrictions, innovative packaging designs are emerging as more top-tier professional package designers get involved. Award-winning designer Edward Kilduff has fielded the Pollen Gear line of cannabis containers that includes glass jars, plastic rectangles, and zipper pouches. Another firm that has developed a distinctive styling for its cannabis brands is Canndescent, which has introduced packaging to match what it calls its “ultra-premium” product line. A guiding principle in the design was to create a clean look that would be less intimidating to new cannabis buyers and attractive enough to entice experienced connoisseurs. Also taking an artistic approach to cannabis packaging is the 1964 Supply Co., which recruits world-renowned artists to visualize the company’s line of cannabis products that are crafted to provide “a selection of strains to suit every mood.” The artists supply packaging imagery for products with colorful names like Train Wreck, Super Silver Haze, Blue Dream, and Strawberry Diesel. Another cannabis packaging trend that is gaining popularity is the tuna-style can. This type of packaging hermetically seals the cannabis product in nitrogen after removing the oxygen. Oxygen and light are enemies to preserving the freshness of cannabis, and oxidation will degrade the plant material and cause mold, yeast, and other potentially harmful bacteria to form. Although the tuna-style method has been used in the food industry for many years, only recently have companies like West Coast Cure and N2 Packaging Systems begun to apply it to cannabis packaging. As N2 Packaging Systems CEO Scott Martin points out, preserving the freshness of cannabis in this manner is probably more of an asset to larger-scale producers that want to keep their product consistent as supply ramps up. That way, he noted, the consumer always experiences the product as fresh as the day it was packaged. With marijuana being so closely associated with the social consciousness of the ‘60s, it is no surprise to see the green movement informing the packaging of cannabis. Reusable and biodegradable packaging is becoming more popular not only because of its environmental friendliness, but to save money as well. Among the packaging companies providing eco-friendly cannabis packaging, Sun Grown Packaging boasts of being the first to file a patent for a recyclable, compostable, child-resistant cannabis package. A cannabis grower that exemplifies the concept of responsible farming is Lowell Herb Co., which has fully embraced the philosophy of organically grown cannabis and all-natural packaging materials. As we can see, cannabis product packaging has taken a big leap beyond the rudimentary packaging of the counterculture days. As cannabis consumption and manufacturing continue to expand exponentially, we can expect to see a similar rise in the innovation and artistry that is transforming the packaging of cannabis products. As the maker of the most modern, integrated, and scalable cannabis manufacturing management solution, MaxQ has deep cannabis industry expertise. Contact us to learn more about the latest trends and business solutions in the cannabis manufacturing industry. Innovation within the cannabis industry is reaching new heights as more and more biotech and pharmaceutical companies enter the fray and the amount of cannabis research and development being conducted accelerates. Cannabis R&D efforts are yielding creative new products and extraction techniques, as well as new methods of manufacturing aimed at making cannabis plant production easier, faster, and higher yielding. Among the most noteworthy new manufacturing innovations are two systems developed by Iaso, called GrowBlox and PhytoX. These systems enable manufacturers to grow cannabis plants indoors at higher speed and without human assistance, and afterwards to extract the valuable ingredients from cannabis plants with greater efficiency and precision. Traditional indoor growing methods require meticulous care and can take almost a full year to yield a successful crop. According to Iaso, GrowBlox can produce five cannabis harvests per year, which would make it the fastest marijuana propagation system on the market. Along with GrowBlox, Iaso developed PhytoX as a way to optimize the cannabis extraction process for medical purposes. Touted by Iaso as the world’s first hydrodynamic extraction system, PhytoX freezes and pulverizes cannabis plants to maximize yields and increase potency, converting the entire plant into nano-emulsions that are then centrifuged and distilled. According to Iaso, PhytoX can perform extraction on wet or dry cannabis, making it capable of producing concentrate from freshly harvested plants. Extracting from wet cannabis plants retains ingredients that are lost in the dry extraction process. In addition, PhtoX’s use of water for extraction eliminates the needs for other solvents. By speeding up and optimizing the cannabis growth and extraction process, GrowBlox and PhytoX have the potential to revolutionize the cannabis manufacturing industry. Iaso also produces cultures to optimize cannabis growth and is developing a new drug delivery system to be ready this year. A number of leading biotech firms are working to develop new ways to extract the active cannabis ingredients and deliver their medically beneficial effects in ingestible and topical forms. Lexaria Bioscience Corp. focuses its R&D on making cannabis medical compounds more absorbable and easily digestible. Lexaria’s process reduces the time of onset for edible cannabis to 15-20 minutes versus the usual 60-120 minutes, and increases absorption by five to 10 times, in addition to masking the bitter taste of cannabinoids without the need to add sugar. Earth Science Tech, Inc. focuses its R&D on producing high-purity, high-quality cannabidiol (CBD) oil and infusing it in digestible products that provide medical benefits while not producing a psychoactive high. Earth Science Tech’s products include vitamins, minerals, herbs, botanicals, personal care products, homeopathies, and CBD oil delivered in capsules, tablets, soft gels, liquids, creams, sprays, and powders. Several companies based in Colorado and California have established reputations for delivering high-quality cannabis products, including unique and effective methods of making cannabis ingestible for pain relief purposes. Viola Extracts has become a leading producer of butane hash oil (BHO) products for the medical industry. Extracting the active ingredients of cannabis using butane produces pure and potent concentrates that are productized in a variety of forms and consistencies that include oil, shatter, wax, and live resins. Another cannabis innovator is Foria, which has received a lot of media attention for its sensual cannabis products for women. For medical uses, Foria provides cannabis suppositories that offer relief from menstrual pain as well as back and hip discomfort. The suppositories provide rapid and long-lasting pain relief. Colorado-based Binske infuses cannabis in a host of high-quality edible and topical products that can be used as an alternative to smoking. Its edibles include chocolate bars, fruit spreads, granola bars, olive oil, and tinctures of garlic, lemon, and chipotle. Its honey products are produced from local bees and can offer pain relief by being ingested in tea. Its topicals include bath salts, body lotion, and massage oils. Another Colorado-based company providing quality medical cannabis products is Altitude Organic. Its line of edibles includes organic treats such as assorted fruit and brownie bars, as well as organic fruit gummy candies. It also sells an extra strength pain spray called Apothecanna. All these standout ventures show how the legalization of cannabis, along with its many medical benefits, is causing an increasingly more diverse and sophisticated set of products to be developed, as well as inventive manufacturing techniques. Expect to see further innovation as more and more companies devote their attention to cannabis R&D and as legalized cannabis spreads to ever more states and territories. Legalizing cannabis in the United States nationally would have a dramatic and far-reaching effect on the cannabis industry, which has been living under the shadow of federal laws that make cannabis an illegal substance. It looks now that nationwide legalization could happen sooner than expected because of New York Senator Chuck Schumer’s introduction of a bill to decriminalize marijuana. Although an increasing number of states have been making medical and recreational cannabis legal, the growth of the cannabis manufacturing industry has been inhibited by the Trump administration’s pledges to enforce federal restrictions. Potential investors have been sitting on the sidelines because of fear that the federal government might take aggressive action to close down the recreational use of cannabis. The muddled legal climate also has prevented many banks from providing accounts to cannabis industry operators. Under the new bill, these sanctions would be lifted and it would be left up to individual states how to regulate marijuana. The federal government’s role would be policing cannabis trafficking from states that have legalized the drug to those that have not, as well as regulating marijuana advertising to prevent children from being targeted. If Schumer’s bill becomes law, marijuana would be removed from the list of substances classified under the Controlled Substances Act. For the world of cannabis manufacturing, this could unleash a torrent of pent-up development dollars and energy. Even under the current legal cloud, the cannabis industry is on track to become a $31 billion empire worldwide by the coming decade. In the United States, the cannabis manufacturing sector is projected to create 300,000 jobs by 2020. National legalization of cannabis would inflate these numbers as a host of states now hesitant to legalize cannabis join the legalization ranks. As Forbes reported, numerous states are on the cusp of introducing legislation to make cannabis legal on a recreational or medicinal basis, including New Jersey, Michigan, Oklahoma, Utah, Missouri, Virginia, and Ohio. If the federal barriers were removed, many more states would fall in line. As the cannabis industry continues to expand, cannabis production centers inevitably will follow the path of other major industries and become large-scale operations. The new Liberty Health Sciences venture in Florida gives us a sense of what we can expect to see over the next few years as more big businesses embrace cannabis manufacturing. Medical marijuana became legal in Florida in 2016. 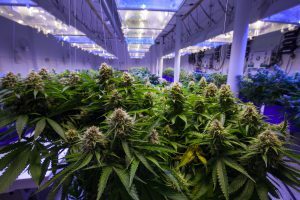 In January, Liberty Health Sciences out of Toronto purchased 242 Cannabis, a 387-acre parcel with 200,000 square feet of greenhouses and processing facilities in Florida’s Alachua County, near Gainesville, for about $30.5 million. The 242 Cannabis operation is a subsidiary of medical cannabis company 242 Cannabis Canada. After a retrofit, the operation is going to include a new 16,000-square-foot processing area in which the company will be able to extract and refine cannabis oils, including adding a kitchen to make edibles. The facility also will produce vaporizer products, some of which will include preloaded disposable pens, cartridges, and pods. Called the Liberty 360-degree Innovation Campus, the facility at full capacity will employ about 150 workers, including chemists, biologists, horticulturists, and customer service representatives. Liberty aims to speed up the process of producing medical cannabis, as well as to bring to market a number of innovative new products. The plan is to produce 27,000 pounds of medical cannabis per year, which would be a large spike vs. the yields being grown in other states. After the cannabis plants are grown, Liberty aims to produce most of its products in about eight weeks, which will increase its ability to put out products and generate revenues. To widen the appeal of medical marijuana, Liberty plans to produce softgels, transdermal applications, and beverages. Although each of these products has been the focus of development and marketing efforts of other cannabis distributors, they have not yet achieved the popularity of other medical cannabis products. For more precise dosing, softgels could become a popular cannabis product in Florida and beyond, particularly for aging populations with a variety of illnesses. Softgels are known for bringing longer relief from pain and other ailments. Transdermal (or topical) applications also are likely to become popular because they make medical cannabis easier to ingest without having to light up. Considering much of the aging population cannot smoke marijuana without health concerns, topical solutions could quickly become a popular means of ingestion. Cannabis beverages offer similar benefits. While a number of cannabis beverages are now available, they have not yet become mainstream products. Liberty Health is part of a new wave of big businesses that are industrializing cannabis production. A spokeswoman for Liberty Health Sciences said its current operation is valued at $327 million. Last year, Liberty bought and took full ownership of another Alachua County medical cannabis operation, Chestnut Hill Tree Farm’s Medical Marijuana Treatment Center, for about $40 million. Liberty’s dispensaries will be called Cannabis Education Centers, the company said, because the industry is new and patients need to be educated about what they are using as an alternative to traditional medicines. Liberty Health Sciences opened its inaugural dispensary in The Villages, a retirement community, in January, and has plans to open five more outlets in Florida this year — in south Tampa, Fort Myers, Fort Lauderdale, St. Petersburg, and Port St. Lucie. Pundits have been predicting that the lucrative opportunity opened up by the legalization of cannabis would lure big business to embrace cannabis manufacturing. The international market for cannabis is projected to increase from $7.7 billion today to $31.4 billion by 2021, according to the Brightfield Group, a cannabis, market research firm. The U.S. currently accounts for 90 percent of global cannabis sales, but its share is expected to drop to 57 percent by 2021, in large part because of Canada’s plans to legalize recreational marijuana by July 2018.